AVC – How difficult can it be ? Ever since the SparkFun AVC started a few years ago, I’ve wanted to enter. But living in the UK made it difficult to justify the expense of flying to Colorado for a robot competition. This year, purely coincidentally I was in the US for a conference the week before the competition. The opportunity was there to enter so I decided to build a robot and enter the SparkFun AVC 2013. The AVC on paper sounds simple 🙂 … Build an autonomous vehicle that can navigate an obstacle course without human intervention. The course is timed and you get bonus points for achieving certain tasks (going under a hoop, going over a ramp, etc.). I decided to enter the ground competition, as the aerial challenge sounded way more complex. I’ve never built an aerial robot, so I thought I stick to something I had experience in. I decided to base my robot on a radio controller car chassis. I had an HPi Racing Savage Flux XS, which was perfect. It’s a 4×4 mini monster truck, that’s fast and simple. Just two controls, steering and speed. In addition, the radio it comes with has three channels, so I could use the 3rd channel as a control to switch between radio control and autonomous control, and quickly switch back to radio control during testing in the event it went berserk and headed for a tree. My bot has a GPS receiver to provide its current position, and a magnetometer to provide its current heading. 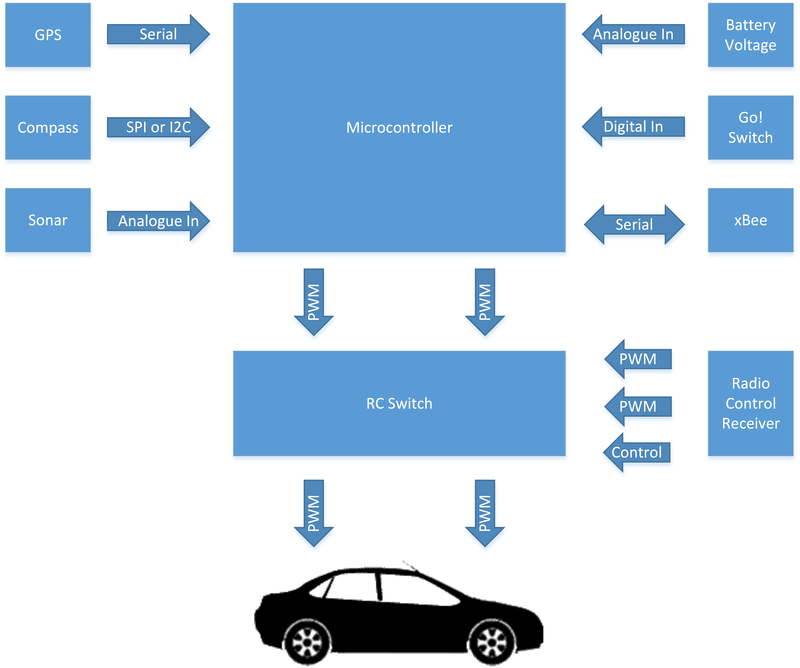 A microcontroller controls the speed and steering servos and a Radio Control switch can switch between autonomous control and manual control using the third channel. In addition the course has obstacles, so I need some basic obstacle avoidance. I used a small sonar to provide the distance to obstacles directly in front. I needed a way to monitor and debug the car while it was hurtling round my garden during testing. I decide to add an xBee so I could get basic debug information from the car in real time, and (as I did with the balance bot) write a simple PC desktop app to display them in a user friendly way. I started with components I already had. 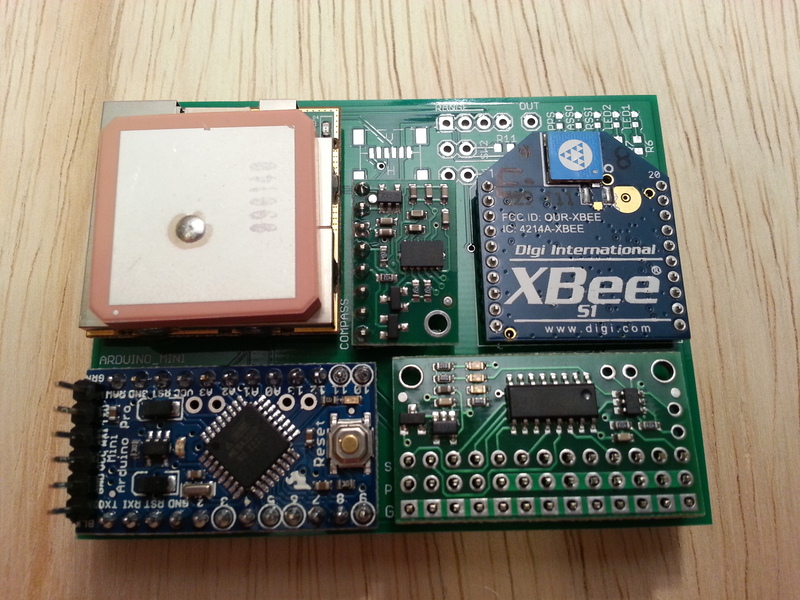 An EM-406A GPS module and a Pololu 3D magnetometer breakout board. I bought a MaxSonar sonar from CoolComponents and an RC switch from Pololu to give me a failsafe control. The initial plan was to use an Arduino, as I have lots of them and lots of experience programming them. As mentioned before, I like old school wire wrap for prototyping, so I prototyped a basic Arduino shield to tie the 3 sensors together. The initial testing went well. I used a third party GPS library and magnetometer library to ingest the data and I could get a basic heading to a GPS waypoint, and get a bearing from the magnetometer on the bench. The PWM output worked controlling two test servos, so confidently I sketched a custom PCB to shrink the design and make it more feasible to fit in the RC car, so I could start field testing in the garden. 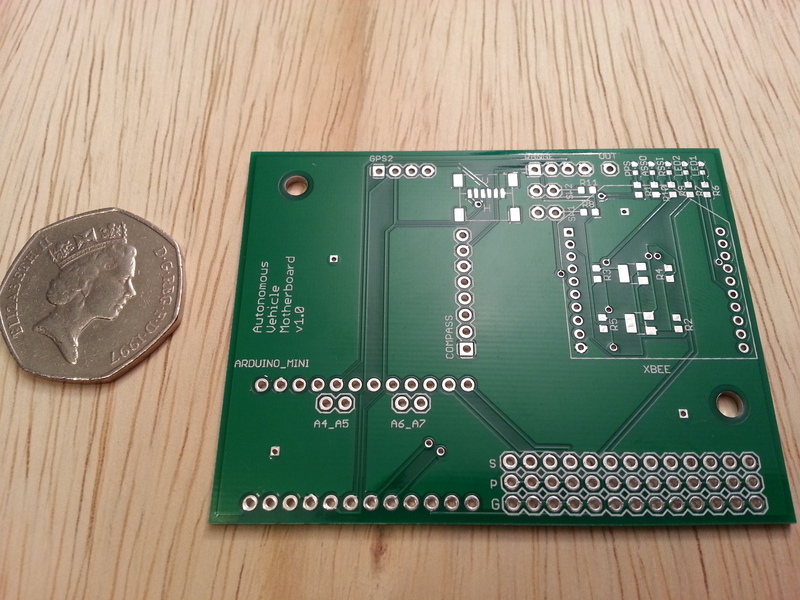 Once the PCB arrived I had the basic software running. The premise of the control system is to navigate to waypoints, so the GPS coordinates as used to calculate a bearing from the current position to the next way point. This is the heading the car needs to steer. However, the car is on rough terrain and will never steer in a straight line. The course the car is taking is provided by the magnetometer, which gives the bearing the car is pointing. To reach the waypoint the difference between the car’s heading and the GPS bearing need to be kept as close to zero. One of the best ways of doing this is to use a PID controller. 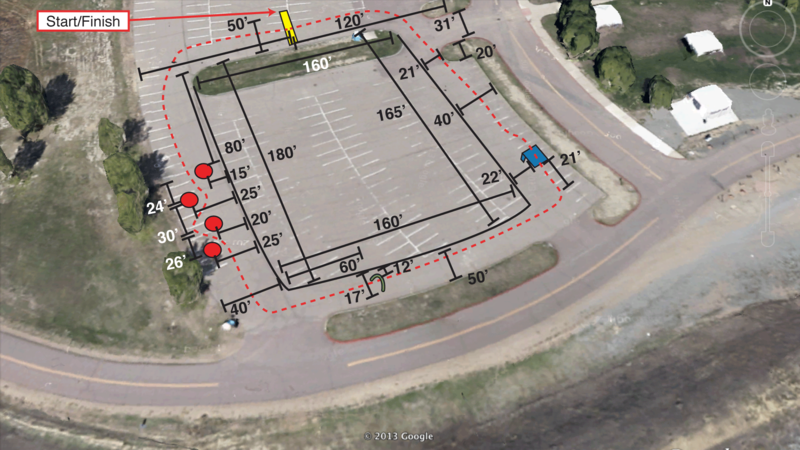 This should steer the car in a straight line from wherever it is, to a defined GPS waypoint. Once it gets within 2m of the way point, it moves on to the next waypoint. Once all the waypoints have been reached, it ends. AVC – It’s ready ! This entry was posted in SparkFun AVC and tagged Autonomous Vehicle, AVC, PID, Robots, SparkFun on June 24, 2013 by mostlyrobots2012. Great project Jon, and congrats on finishing the course. The simple PID approach seems to have worked well in this case. Have you looked into beefing up the brain of your rover to do mapping in addition to just GPS coordinates and magnitometer readings? It would be an interesting improvement, if you sort out the dead recknoning you should get some basic with the sonar even! At the hackspace yesterday I spoke to Rob from studentrobotics.org he was talking how eventually he wants to have something similar open to all age groups, would be great to have something like that in AVC challenge in the UK.